The Yiddish Song of the Week is glad to be back after a brief hiatus caused by a hurricane-related telecommunications breakdown. 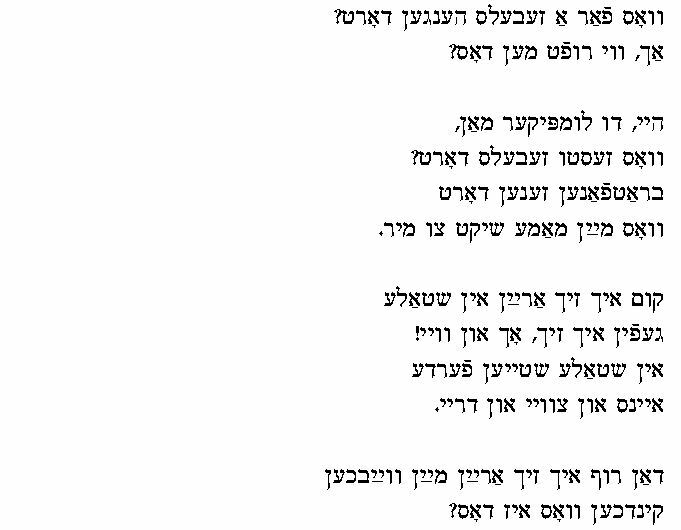 “Dos Daytshl” (“The German Guy”) as sung by Lifshe Schaechter-Widman [LSW] (see previous posts for her biography) is linguistically the most complicated song yet posted. The comic ballad is international and found in many languages and is known in the Child canon as “Our Goodman” (#274). The texts have remained remarkably similar through time and languages. 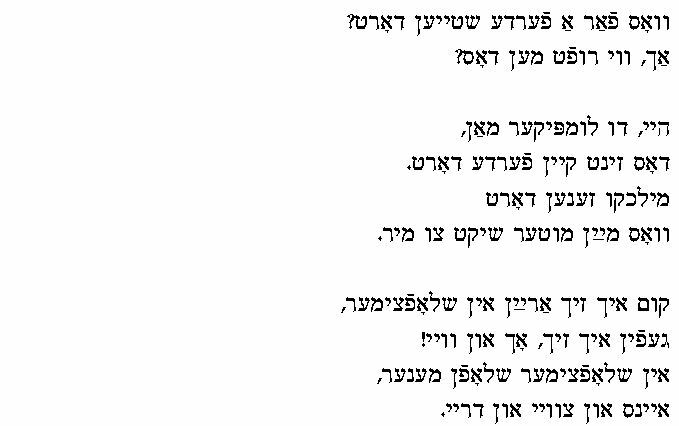 My folklore professor at the University of Pennsylvania, Kenneth Goldstein, played us a field recording he had made of African-American kids in West Philadelphia singing a rap version of this ballad and the words were almost the exact ones as the Yiddish lyrics LSW sings. In The Folks Songs of Ashkenaz (pp. 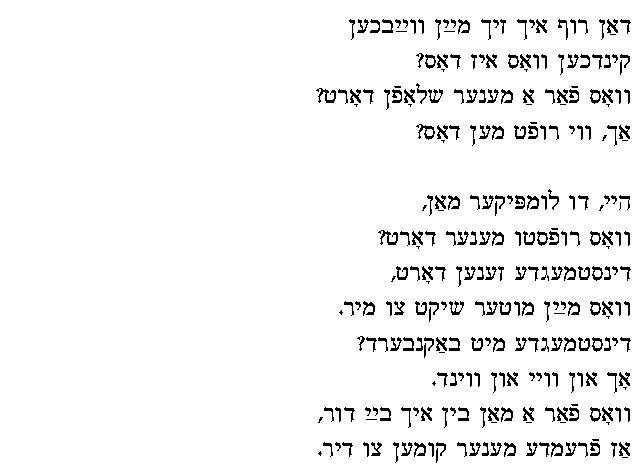 139 – 142) edited by Philip V. Bohlman and Otto Holzapfel (2001), the editors make an interesting comparison of a Yiddish version found in the Ginsburg-Marek collection to a German version collected in German colonies in southern Russia. 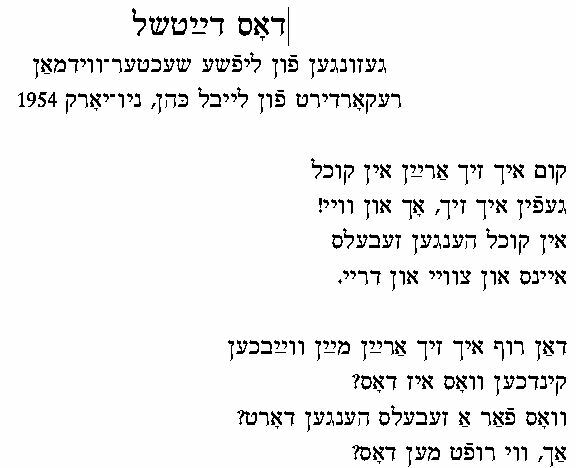 Unfortunately, they only compare the texts, though several Yiddish versions with melodies have been printed (for example, one melody of a Yiddish version exists in Yidisher folklor, YIVO 1938). Their brief history of the ballad indicates that the German versions of the song came from a Scottish variant in late 19th century, and after it was published in a German almanac in 1790 it circulated much more widely. 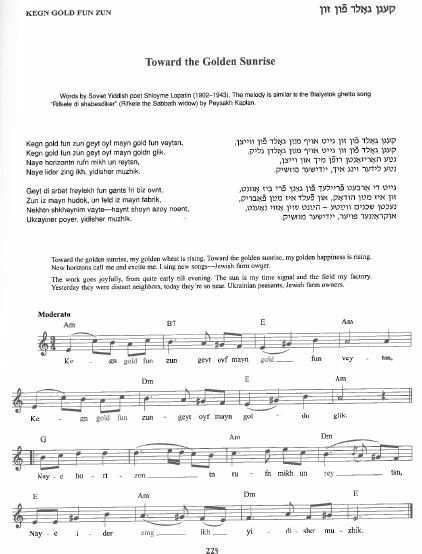 There are many printed Yiddish versions of the song, most recently in Yiddish Folksongs from the Ruth Rubin Archive (p. 30-31) edited by Chana Mlotek and Mark Slobin. Their introduction refers to other printed Yiddish versions. On the Yiddish ballad in comparison to other international versions read Chana Mlotek’s “International Motifs in the Yiddish Ballad” in For Max Weinriech on his Seventieth Birthday. The Yiddish ballad was still popular into the 1930s in Eastern Europe. 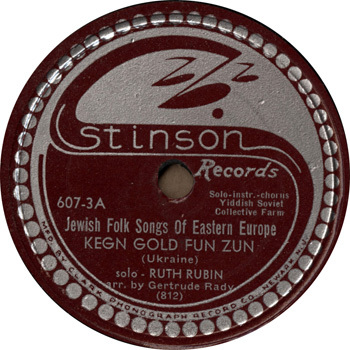 Since LSW comes from the Bukovina, where Jews were fluent in Yiddish and German, the German element in the song has to be analyzed not just as Germanisms in a Yiddish text, but as to what these German words evoke when sung by a Yiddish folksinger who is performing a comic song making fun of a German. Does the singing of “Eyns, tsvey, drey” and not “dray” which would be the correct form in both Yiddish and German, indicate a funny hypercorrection of a German based word in Yiddish? Of course, it’s not just any German being made fun of here, but a German peasant or farmer. The Germanisms also imply that such a song about a cuckold would “never” be sung about a Jewish husband and wife. Since LSW usually sings slow mournful songs it’s refreshing to hear her sing a comic song with such gusto and drama. Gefin ikh zikh – okh un vey! eyns un tsvey un drey. What do I find – woe is me! One and two and twee. Vos far a zeybls hengen dort? Dear child, what is this? vos mayn muter shikt tsu mir. what swords do you see there? and what do I find – woe is me! akh vi ruft men dos? Dear child what is this? vos mayn miter shikt tsu mir. Those are not horses there. that my mother sent to me. Gefin ikh zikh okh un vey! Dinstmegde (n) mit bakn berd? az fremde mener komen tsu dir. Servant girls with bearded cheeks? If strange men are visiting.